On 18 April Carbon Tracker, a UK-based foundation-led initiative, released its second report, Unburnable Carbon: Avoiding wasted capital and stranded assets. We need a managed, rapid and complete retreat from the use of fossil fuels if disastrous global warming is to be avoided, Jeremy Leggett, chair of Carbon Tracker, tells Caroline Hartnell. We need to replace these high-carbon fuels with renewable energy, and we need to do it fast, as though preparing for war. And yes, foundations do have a huge role to play. What is now needed to prevent the world reaching and passing the two degrees of warming threshold? Basically, we need a paradigm shift in the way we use energy. We need a managed, rapid and complete retreat from the use of fossil fuels and we need to replace those high-carbon fuels with renewable energy and energy efficiency. As fast as we can. We need to mobilize as though preparing for war – at that kind of speed. That means a lot faster than we’re doing it at the moment. Clean energy is growing, but not fast enough. Emissions are still rising. Some might see the problem of climate change as so huge and intractable that only governments can address it. Is there a role for private foundations, individual philanthropists and impact investors? Clearly, we do need much more leadership from government on climate. You saw this at the Earth Summit in Rio when the heads of state of the key countries didn’t even bother to turn up, and yet this is an issue where the future of civilization is at risk – as world leaders are being advised by their own scientific centres of excellence. But there are also roles for others. I actually think some corporations are doing better than government. Take IKEA, which is putting solar panels on every roof in every store in 30 countries. Foundations have a huge role to play, too. We have to catalyse a peaceful revolution in energy markets. The University of California has shown that it can be done, and modelled running the world with 100 per cent renewable energy by 2030. To do it, you don’t have to mobilize technology any faster than we have already done for things like the internet and mobile phones. Where should philanthropy focus its energies? On advocacy to promote better government policies, investment in alternative energy, adaptation for the world’s poorest? First, some foundations are already doing a fabulous job in pushing things in the right direction. Carbon Tracker, whose second report has just been published, is a foundation-led initiative. Carbon Tracker makes a really powerful argument. It points out the disconnect between what climate policymakers have said they’re going to do, which is to cut emissions deeply, and what the capital markets routinely do with fossil fuels, which is to put them on the balance sheets of companies as though they are assets at zero risk of impairment. This is really capital markets sticking a finger up at government and saying, ‘You know what, we don’t believe you’ll ever do anything.’ Consequently, people who are investing money in fossil fuels are not having that risk recognized. So Carbon Tracker brings the risk of unusable assets out into the open. Once it is recognized, investors are going to start acting accordingly, which means investing less in fossil fuels and more in clean energy. In our first report, we quantified, company by company in the top 200 oil, gas and coal companies, what the exposure to this kind of risk is, and we also quantified it stock exchange by stock exchange. In the second report, we dug deeper into this, and I think that we are gaining traction with these arguments. It came about like this: I was writing about these things in a qualitative way and was contacted by the Growald Foundation, who urged me to campaign on this basis. As it happened, I knew some analysts in the City of London who were looking for some funding to do advocacy so we were able to marry the funder up with the analysts – Mark Campanale, James Leaton. They produced the report and I am the chair. How important is it that stock market valuations of fossil fuel companies should reflect the fact that most fossil fuel reserves can never be burned if we are to avoid runaway global warming? The new report shows how much money is at risk of being wasted on stranded assets over the next decade – more than $6 trillion. It is also more specific about the recommendations that it makes, sector by sector, across the financial chain – what the financial analysts need to do, what the accountants need to do, etc, in order to recognize the risk. Here in the UK, the regulator of the capital markets is the Bank of England. We had a meeting with them last year and said, ‘you need to require people to recognize this risk’, and their response was, ‘hmmm, yes, you may have a point here. Let us think about it.’ They’re still thinking about it, but we’re hoping that now this second report is out, they’re going to be under quite a lot of pressure to do more than think, to take some action, as they are responsible for the stability of the capital markets. We’re talking about a bubble, which will eventually burst if it isn’t deflated in a sustainable way. That’s a serious crash risk. What can the Bank do to bring down the cost of fossil fuel shares? It’s not the same as saying to fossil fuel companies that they have to recognize that these assets will be impaired, but it requires that the risk be discussed. And, of course, as soon as it’s discussed, what are fossil fuel companies going to say? They are going to have to say, ‘we think these assets will never be impaired because we think the government will never do anything about climate change.’ This will create pressure on governments. That’s what we’re after, recognition of the risk – and the regulator could do it at a stroke. Of course, others could jump before they’re pushed. Accountants, for example, could tell companies that they weren’t going to sign off on audited accounts without discussion of whether assets are at risk because of climate policy-making. But they may need to be pushed, and we’re hoping that 350.org and the various civil campaigns that are under way on climate change will be powerful ammunition for this. Can you say something about 350.org, which I gather has been making explicit use of Carbon Tracker? They’ve been going around university campuses in the US, talking to students about the carbon arithmetic we describe in our first report, trying to persuade them to pressure university authorities to divest themselves of fossil fuel holdings. It’s had some success. Now they’re bringing the campaign to Europe. 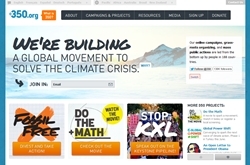 Some say the 350.org campaign is too simplistic, but I think it’s vital, personally, that intra-market campaigns like CarbonTracker’s have easy-to-understand civil campaigns pushing in parallel. 350.org founder Bill McKibben and I wrote an op-ed in the Guardian essentially making this point. How important is investment of foundation assets as opposed to their grantmaking? It’s very important. Foundations can lead from the front in this regard. I know that there are different views in the foundation community, but it is absolutely imperative that foundation portfolios look beyond short-term rates of return. But I would go much further than where they invest their assets. I would say now is the time for them to table the whole lot or an appreciable amount of the actual endowment, and really go for it because we are in the last chance saloon. We really need to turn things around this decade or I fear we are going to lose this battle and our civilization will collapse. I know it sounds dramatic but that’s what I genuinely believe. And I’m far from alone of course. If you’re a foundation, what is the point of sitting on all this money, deploying it in small parcels of the whole every year, if you find that by the time we get to 2020 global warming is accelerating so fast that we’ve passed the point of no return? What are you actually suggesting? Should they be spending down their money or investing their assets in things like development of renewable energies? It’s not one thing or another. I think they should be tabling all their money. It’s not necessarily spending it down because a lot of this could be investment. If there really is a green industrial revolution, for example; if we can team up to find new ways to mobilize capital, like massive-scale crowdfunding and peer-to-peer lending; if we can take the capitalization of the future out of the hands of these short-term bonus culture banks and mobilize people power, foundation capital could really create seismic change. I’ve written a book called The Energy of Nations: Risk blindness and the road to renaissance which talks about how we do this incredibly difficult thing of turning around what is a suicidal system. I’m not just talking about energy but the way we are glued to the financial system. Foundations could do a better job by acting in a way that’s appropriate to the degree of danger that civilization is in. Presumably the very first thing you would want them to do would be to divest themselves of all the assets they have in fossil fuels and invest in sustainable energies? Yes, but in a way that’s sustainable because this can’t be done overnight. You know the crucial word in ‘managed rapid retreat’ has to be managed. If everyone divests immediately – an unlikely eventuality – and an important fossil fuel company collapses overnight, that’s hardly sustainable. So divestment is important, but the crucial thing is to accelerate the alternatives. By investment of assets and by grantmaking? Yes – massive grantmaking directed at things that could really change the financial system, for example, the way that finance itself operates, like persuading pension funds to act as though pension holders of the future should have a viable future to retire into; mobilizing crowd funding; overcoming regulatory hurdles. There’s so much that could be done if there was a foundation blitzkrieg on the problem. How important is it to counter climate change scepticism? It’s important but we’re not going to win the war that way because the neuroscientists and the psychologists tell us that this is a tribal belief system and you won’t deconstruct it with rational argument. You just have to accelerate the survival technologies and ultimately make the argument irrelevant because people will just realize that the world is going as fast towards green energy as it did towards the internet or the digital revolution and, actually, what’s the point of standing in the way of it? You’ve got to take the climate argument away from the sceptics. What about nuclear energy, which is often put forward as a more viable, quicker alternative? It’s not quick at all actually, by the admission of the current generation of reactor builders. In Europe, for example, from the moment they are commissioned to build these new reactors to them coming alive is at least 10 years. We don’t have 10 years. So for that reason alone, I think it’s a bit of a distraction. What about changes to lifestyle, consuming less? Yes, that is important as well. We can’t shop our way out of this problem, we need a cultural realignment. Once again, there are very important things to be working with here. If you look at what’s happening in Europe with community energy projects and the renaissance of community and resilient transition movements, all this leads towards a society where we can imagine people beginning to say true prosperity is not measured in GNP. We’re encouraged to obsess about quarterly growth, all this kind of stuff. If people begin to say, ‘we want quarterly growth in security, in happiness, in safety, in community well-being’, then all these things become possible. I work in the solar energy industry. We are often accused of believing there are technical fixes to climate. Of course there are – we can put up buildings that are carbon-zero in a matter of weeks with the right partners in the construction industry. So, there is an awful lot that technology can do, but at the end of the day, it’s going to take more than that; it’s going to take a rethink of the building blocks of civilization and community, and I think the renaissance of community has to be a key part of that. Are we, in the West, going to need to accept some sort of reduction in our material standards? As developing countries’ economic growth takes off, their emissions rise, and if we continue as we are it’s hardly fair to expect them to forgo the kind of prosperity we have already enjoyed. I wouldn’t put it like that. The definition of prosperity doesn’t all hinge around what your revenue is. But in terms of curtailing ridiculously disposable consumption, absolutely. But I would always couch that in terms of an increase in prosperity, in quality, in standard of living. It’s ultimately going to be an increase, taken in the round, of the things that renaissance can bring. This isn’t really controversial any more. We get some key elements of the commentariat in the Financial Times talking about this sort of thing, the Stiglitz Commission, the Commission for Sustainable Development and their Prosperity Beyond Growth thinking. More and more people are coming to this conclusion, but it is important that it’s couched in the right way. Jeremy Leggett is chair of Carbon Tracker. He is also founder and chairman of Solarcentury, one of the UK’s fastest growing renewable energy companies, and founder and chairman of SolarAid, an African solar lighting charity set up with 5 per cent of Solarcentury’s annual profits, and itself parent to a social venture, SunnyMoney, that is the top-selling retailer of solar lights in Africa.